Edutainment - Piano Tutorials | Learning Made Easy! Piano Video Lessons & Tutorials! This is Shohini, and I am very pleased to have joined Edutainment! Playing the piano is my hobby and although I had wanted to play the piano since I was a child, I got the chance to learn and play this glorious instrument only as recently as 2005. I love picking up songs by ear and letting my mood decide what I play! I am sure that all you piano lovers will agree that handing control of your thoughts to your fingers as they play the piano is nothing short of beautiful! Here is an honest confession though: I have never really been very fond of reading sheet music and prefer playing by ear any day! It feels great to be a part of The Piano Encyclopedia team and I am very excited about bringing to you new songs to try out on the piano as part of the Piano Video Tutorials column of Edutainment! I also have very exciting news to share! After almost three years of development, and more than 50 contributors – musicians, pianists, developers, graphic designers, writers and editors from all corners of the world, the second major venture of The Piano Encyclopedia, The Logic Behind Music Digital Home Study Course is completed! Piano enthusiasts everywhere, rejoice! The method that revolutionizes conventional piano teaching is about to be unveiled to you! I have been personally talking with Rod (the CEO & Founder of The Piano Encyclopedia) and he has been telling me some of the high points of our Digital Home Study Course. It is a dream come true for all of us here as we look forward to presenting before you the most exciting and fun way to “tickle the ivory”! Interactive, innovative and exhaustive, The Logic Behind Music aims to help music enthusiasts learn the theory of music in a ‘practical way’ so that they have no trouble whatsoever in composing and improvising and get a well-deserved boost on their way to becoming musicians. So if you love playing the piano and don’t want to merely “interpret” music but “create” it as well, The Logic Behind Music is perfect for you! Do watch this space, everyone, as I will be keeping you up to date with all the “secret” and inside sneak-peek news of the launch of the Digital Home Study Course “The Logic Behind Music”! Yellow strikes a hypnotically alluring note right from the first few chords. Produced by Coldplay and Nelson, Yellow released in 2000 and was the band’s first breakthrough hit. The song remains an eternal favourite among Coldplay fans even nine years after its original release. Hauntingly beautiful, it is one of those songs that you simply cannot stop humming once you hear it! In fact, Yellow is one of my all-time favourite songs! The background music in the original song is mostly acoustic guitar, however, a song as melodious as Yellow can’t possibly sound anything but good on piano, can it? The first video here is a tutorial that shows you how to play the song by slowly showing each note with the accompanying chords. If you are just starting out with the song then getting the notes right is very important so you can learn the right notes to play from this video and then listen to the actual song to get the tempo right. The next video is an amazing piano rendition by Adrian Lee who has played this entirely by ear. You can see the notes and chords that he has played quite clearly. How we all wish we were this good, right? Now let me tell you a little about the original song video. The band had come up with the idea to film the video in a happy, sunny background with moving stars in the sky – an allusion to the lyrics. Yet, the weather played spoilsport with Studland Bay, where the video was filmed, being held hostage by howling winds and rain. Right then, let us have a look at the video itself! I hope you liked this piano lesson! If you would like to take your piano playing skills to the next level so that you can easily play all the songs you love on the piano, do look forward to the launch of The Logic Behind Music! I promise you that you will have even more fun creating your own music following our approach towards learning music! Now we have a new fun feature as part of the run-up to the release of The Logic Behind Music. I will be asking trivia questions regarding the song taught in each post and all of you are invited to submit the answer in the comment box. In a particular quiz, the first person to give the right answer will be the winner. We are also going to have weekly “merit lists” where I will mention the winners with the most number of correct answers in this very column! Sounds exciting, right? So are you ready for today’s question? Here it goes! What, according to the band is the theme of the song, Yellow? Piano Tutorials Up and Coming – Have a Say! Wow I can’t believe it’s been since before Christmas since our last post and figured it’s time that we give you a little bit of an update. For all our piano followers you’ve probably also been hitting up the truly astounding Piano Encyclopedia site that we’ve been working up buttocks off on for over a year now. It is really coming along and I must say, if I wasn’t apart of helping work on things I’d be getting on board myself. The developments that Piano Encyclopedia has been going through is above what we even expected at first. We started off with all these simplistic ideas, but they soon skyrocketed into some of the most amazing ideas we’ve ever had. Not only will you be able to interact with other piano enthusiasts like yourself, but get to learn many new tricks along the way! Since this has taken up a lot of our time we’ve sort of slacked around here and so sorry for that. When we get glued to an idea, we really put our all into it. Apologies. Now that things are beginning to come together I figured on behalf of The Piano Encyclopedia team I’d post a little update to let you know we are still alive and kicking. The blog hasn’t died, we are just a little preoccupied! I myself will do everything in my power to start posting more Piano tutorials in the future while the rest of the team continues working in finishing all the final touches of Piano Encyclopedia and help you guys learn all those truly amazing songs. Since we haven’t posted since December any new tutorials there is guarantee quite a few new songs out there everyone wants to learn so give me a shout and let me know! I am always game for learning something new too so don’t be shy. C’mon we are all learning here, so let’s at least throw it down and get some good grooves going on up in here! Rihanna fan or not, Take a Bow was beautifully composed and written by Neyo and the production team Stargate. Released in 2008, Rihanna’s single has risen to the top. Men lovers worldwide enjoy this song…there is just something about the sarcastic singer croning to her boyfriend that his “performance” was an Oscar winner. 🙂 Enjoy this first performance of mysterious hands showing us the keystrokes to the ballad Take a Bow. David Sides does a beautiful rendition in the next youtube video. All is not lost when it comes to the material that can be found on the internet…parental supervision not required : ). Ahhh yes, handsome guy and a stunning gal (not me…Rihanna) almost always make for a good video. Take a Bow is a wonderful ballad, and I wish you a great deal of fun while you take the time to learn how to play this song. I am glad to announce that Sheena has joined Edutainment, so from now on you’ll be enjoying great piano lessons from both Chrissi, Sheena, and myself. Sheena is a total piano lover and she’s ready to join in the fun. My newest endeavor is to continue what this site has started: providing various video tutorials of classic and modern songs played on piano by unknown avid pianists and by the original bands. Music to my ears, right? Look out for new piano tutorials coming to your computer soon. Ciao! Tell Sheena and me what you’d like to learn next! Piano Encyclopedia Lesson Report: Music Fundamentals Release Today! I’d like to tell you about Piano Encyclopedia’s upcoming release of the Piano Lesson Report I: Music Fundamentals on October 5th at 4pm EST. We’ve shown you videos on how to play certain songs throughout our blog and thought that the Piano Lesson Report could really help you out in actually understanding how to play those songs you love. It can be difficult learning a song without actually knowing what the keys are called and how they should be played with a certain note, so Piano Lesson Report I: Music Fundamentals could help you understand how to play all those songs you love. Let me show you some of the things that Piano Lesson Report I: Music Fundamentals includes so you can see what I mean when I say you could actually understand how to play the songs, instead of just knowing what key to push. Discover how mastering scales, chords, and music intervals will take your piano skills to the next level. Get a sneak peak into more complex Jazz and Blues chords and the role music intervals play here too. Discover the relationship between Scales and intervals, and get a sneak peak into some interesting scales. As you can see you will actually get an understanding of the chords, scales, and intervals which could really help you out in the end because every song is created by a chord and then a scale and then intervals. Now if you’d like to get your hands on Piano Lesson Report I: Music Fundamentals but are worried that its going to cost you tons of money, don’t be. Piano Encyclopedia is actually releasing it with no price, meaning you won’t have to pay for a thing. You will get 55+ pages of unique content, over 100+ illustrations, and over 7 piano charts without having to pay a thing. Now if you were to go to a music store and look for the same thing you’d pay an arm and a leg for numerous books that are full of nothing but repeat content in each. The release will be on October 5th at 4pm EST, but Piano Encyclopedia is actually offering bonuses for those that subscribe to receive Piano Lesson Report I: Music Fundamentals before 4pm EST. If you are interested just simply click on the following title and it will take you there to do so. You can also look through Piano Encyclopedia’s blog for further information on Piano Lesson Report I: Music Fundamentals. They have been updating their blog constantly to give the viewers more information on the release and reminding everyone the amount of time they have left before people can no longer reserve their spot to receive Piano Lesson Report I: Music Fundamentals plus the bonuses. You can still reserve your spot after 4pm EST, but you won’t receive the bonuses that are being included for the people that reserve their copy before 4pm EST. Hope that I’ve helped you out even further with learning how to play your piano. 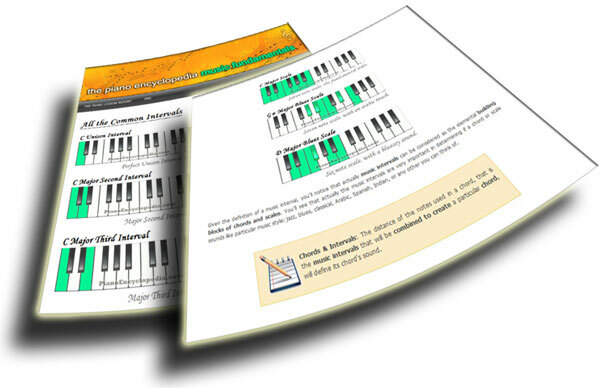 Feel free to leave feedback or questions on Piano Lesson Report I: Music Fundamentals. I’ll gladly answer all questions and feedback that you throw at me. This is an amazing song that has become quite popular all over the American radio broadcasts with the help from Timbaland. One Republic was a band that not many knew about in various parts of the world, but now everyone is seeming to rave about them. With the popularity of the song Apologize I thought it would be a great idea to teach everyone how to play this beautifully melodic song. If you haven’t heard this song before I highly recommend you listen to it. Here is a link to a video of this song so you can truly hear what I mean about this song being one of the best. This is the version that includes Timbaland because I feel this version gives you a better feel of the piano and emotional portrayal that it is trying to give its listeners. I can truly say I myself can be caught singing this song any time I hear it and have downloaded & purchased the One Republic CD just so I can listen to it whenever I want. When you listen to this song the wording with the inclusion of the many different instruments such as the cello and violins just makes the song feel even more put together then most you hear on the top 100 music hits lists now a days. Throughout the site you have most likely discovered many piano tutorials. Now we are going to experience the song Piano Man which has been done by Billy Joel and accompanied by Elton John some occasions. This song is a great display of great musician multitasking with the use of a harmonica, the piano of course, and vocals. The first video that you will experience will be a fabulous piano tutorial which will take you through the entire songs piano parts. If you take a look at this gentlemens youtube site you will discover he does a lot of piano tutorials, each being just as good as the next. Lets take a look at his well layed out tutorial. He does the tutorial so well you will be able to go through it just a few times and have the song pretty much down pat. Throughout the world you will discover many covers done of Piano Man but none quite like the next video you will take a look at. He is capable of doing all the things that Billy Joel does himself, including the harmonica and vocals. It is one of the most amazing covers I have ever seen in my entire life. Now that you have sat here through the tutorial and one of the best covers ever, I think its time we take a look at Billy Joen himself and a special guest known as Elton John playing this song live. This is a great version of the song done by these two amazing singers. All the camera angles of that video were done fantastic. Hope you enjoyed that as much as I did. I know I have been singing this song in my head all day long since I watched this video. Now that we have learnt the fascinating song Piano Man it is time to rest our fingers and begin our next upcoming tutorials. Bookmark this blog, there are new posts coming your way. Coming up soon will be a treat of newer songs coming from Justin Timberlake, Christina Aguilera, and many more. Want us to post your articles? Master Composing, Improvising, and Take your Piano Skills to the Next Level! Enjoy a unique Piano-Learning Experience. Maire Langenheim on Why Edutainment? Write us with your proposal if you are interested in being our sponsor.